Job Growth Slows Sharply, But Unemployment Rate Dips : The Two-Way Just 88,000 jobs were added to private and public payrolls in March. The jobless rate still edged down to 7.6 percent — but only because nearly half a million fewer people were in the labor force. 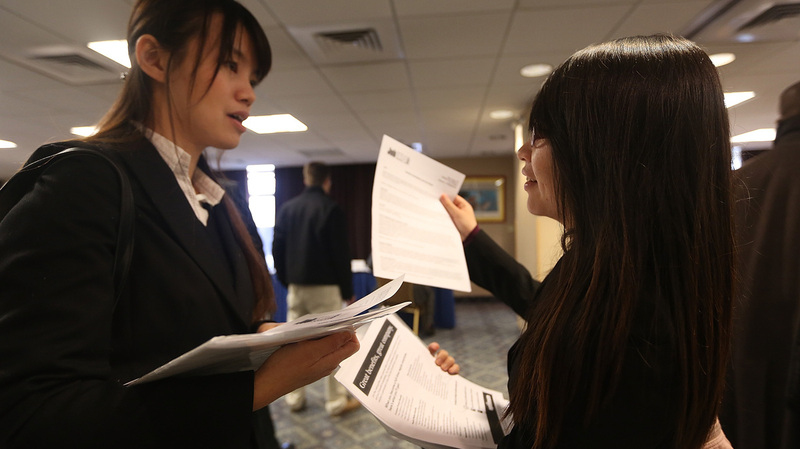 Li-Wen Hung (left) and Whitney Chen were waiting to meet potential employers at a Manhattan job fair earlier this year. There were just 88,000 jobs added to private and public payrolls in March, the Bureau of Labor Statistics estimates. But the nation's jobless rate still edged down to 7.6 percent from 7.7 percent. That dip wasn't for a good reason, though: Nearly half a million fewer people were participating in the labor force. That smaller pool meant the jobless rate could tick down even as job growth was weak. The news was not in line with expectations. As we reported earlier, economists were expecting to hear that payrolls had grown by 200,000 jobs and that the jobless rate had remained at February's 7.7 percent. But the news was in line with the general trend. While the economy continues to add jobs — and has been steadily since mid-2010 — that growth remains slow and could weaken some more as the effects of the federal government's sequestration budget cuts take effect. We'll have more from the report and reactions to it as morning continues. Be sure to hit your refresh button to see our latest updates. "While more work remains to be done, today's employment report provides further evidence that the U.S. economy is continuing to recover from the worst downturn since the Great Depression," writes Alan Krueger, the president's top economic adviser, on the White House blog. He adds that "it is critical that we continue the policies that are helping to build an economy that creates jobs and works for the middle class as we dig our way out of the deep hole that was caused by the severe recession that began in December 2007." Krueger also writes that "it is important to bear in mind that the March household and payroll surveys are the first monthly surveys to look at employment since the beginning of sequestration. While the recovery was gaining traction before sequestration took effect, these arbitrary and unnecessary cuts to government services will be a headwind in the months to come." Shortly after the opening of trading in New York, the Dow Jones industrial average was down about 140 points (1 percent). Other indices were down 1-1.5 percent. "The president's policies continue to make it harder for Americans to find work," House Speaker John Boehner, R-Ohio, says in a statement sent to reporters by his office. "Hundreds of thousands fled the workforce last month and unemployment remains far above what the Obama administration promised when it enacted its 'stimulus' spending plan." The White House typically posts its analysis here. We'll watch for that. "The labor market had some reasonable momentum over the past several months, but with just 88,000 job gains in March, once again we see a disappointing seasonal slowdown unfold as we head into spring," writes Kathy Bostjancic, director of macroeconomic analysis at The Conference Board, a business research group. "What is even more troubling about the most recent slowdown," she adds, "is that it takes place even before the sequester cuts materially hit the economy. This reinforces our view that the estimated 3.5 percent real GDP growth in [the first quarter] is not likely to be sustained. Instead, we see the overall economy, led by the consumer, downshifting significantly in the second quarter, struggling to get close to 1 percent real growth." Update at 8:55 a.m. ET. Bear In Mind, There Are Really Two Surveys. This issue often comes up when BLS issues its report: The two headline numbers — the jobless rate and job growth — can seem to signal different things because they are based on separate surveys. BLS derives the unemployment rate from a survey of households. Basically, it asks thousands of Americans a series of questions aimed at determining how many are and aren't working. In the other survey, it contacts public and private employers in an effort to determine how many jobs they have on their payrolls. Though the March payroll employment figure was surprisingly low, BLS also on Friday revised up its estimates of growth in January and February. Initially, it reported that 119,000 jobs had been added to payrolls in January. Now, it says there were 148,000 jobs added that month. And it had earlier reported that 236,000 jobs were added to payrolls in February. Now, it says there were 268,000 jobs added that month. It is possible, of course, that a month from now BLS will say there were more than 88,000 jobs added in March. According to BLS, there were 496,000 fewer people counted as being part of the labor force last month. And, the "participation rate" declined to 63.3 percent from 63.5 percent. So, despite the weak job growth picked up in the agency's survey of employers, the jobless rate was nudged down to its lowest point since December 2008's 7.3 percent.